Companies rarely flounder due to a lack of raw talent. An over-concentration on their core activity – with an equal neglect of the ABCs of financial processes – is much more likely to be fatal. Naturally, a strong Finance Director is a perfect guard against this. But, they still need up-to-the-minute centralised data on profitability, analysed by client, market sector, type of work, team or department. Synergist can supply all this and more; including complete sets of drill-down supporting data plus a seamless link to the accounting system. 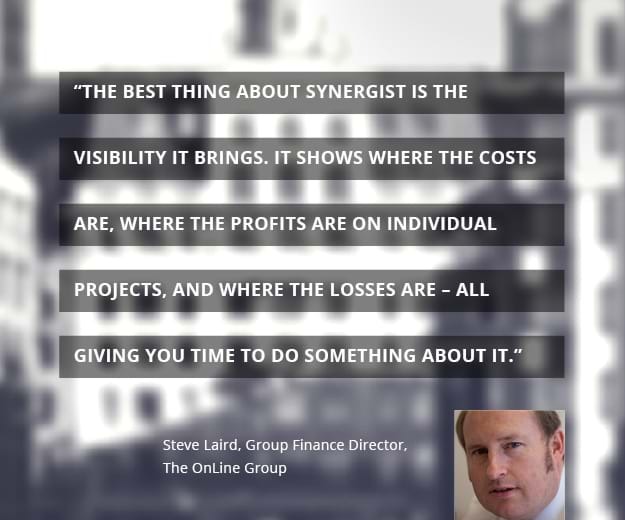 As well as proving itself with a strong ROI, Synergist also impresses during the procurement process by offering a wide variety of options to suit all organisations rather than an ‘off-the-shelf take-it-or-leave-it’ package.